>Well that’s nifty. Sun apparently purchased a Virtual Machine developer (Innotek) and is now releasing the fruits of their work for free. I was reticent to purchase either VMWare Fusion or Parallels (the two most popular VM apps) to run my (legitimate) copy of Windows XP (No really, I bought it) on my still-fairly-new MacBook. Yay! It appears to support a “seamless” mode, just like the other two, but I’m not sure yet if it has true multi-monitor support, which I definitely must have. Although since it’s supposedly open source, someone might add that feature very soon (if it’s really not there yet). And this is what makes it truly awesome for more than the fact it saves me $70 (or whatever those expensive VM apps are going for these days): there will be a community supporting it. Standing before a room of oil company executives in June, John McCain flip-flopped and declared support for coastal oil drilling. Now the Washington Post is reporting that, within days, oil and gas execs ponied up nearly $1 million to elect McCain.1 It’s another piece of evidence that in a McCain White House, oil companies will call the shots—just as they have with President Bush. Here’s a video that makes the case, from our friends at Progressive Accountability. The energy crisis is shaping up to be a decisive issue in the election. MoveOn’s ongoing campaign on the energy crisis has two goals: 1) highlight the progressive solution—a huge plan to shift our economy to clean energy, prevent climate change, and create millions of jobs, and 2) work together to block McCain and the Republicans from pushing gimmicks like drilling to win votes. I highly recommend this documentary about how Monsanto has changed farming and lives of Americans and other peoples worldwide. Although the film doesn’t make this connection directly, it’s little wonder why our cancer rates in America are some of the worst after seeing the evidence from even Monsanto’s own scientists. This affects 70% of the food supply in America. You also learn how Monsanto is literally ruining the lives of farmers in America, India and other places. This image does an even better job of contrasting his contradictory statements. 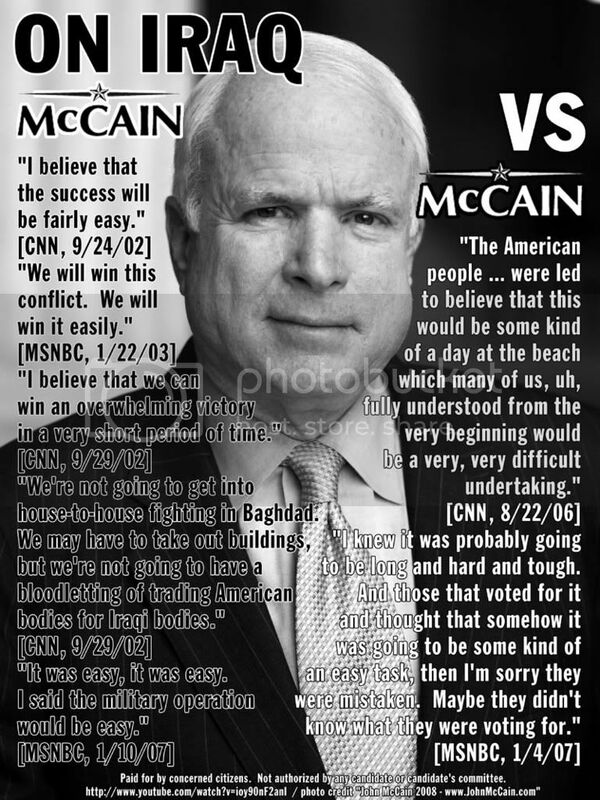 In an effort to collect the various stances mr. McCain has done 180’s on since entering the running for the presidency, I’m going to start a series of posts following this format. One of the main things those on the right use to recommend this candidate are his supposed rigid consistency in voting on various issues. Since this is a complete fallacy I intend to offer up real evidence to the contrary that I regularly discover through articles throughout the web.